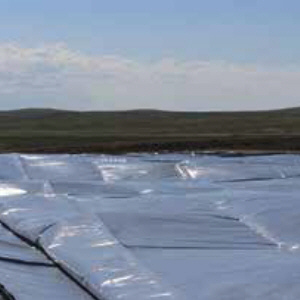 GEOSKRIM® J30BD is a linear-low-density polyethylene geomembrane with an encapsulated polyester scrim reinforcement. In addition to excellent dimensional stability the tridirectional reinforcement provides exceptional tear and puncture resistance. GEOSKRIM® J30BD is a versatile black/gray geomembrane. The gray outer layer minimizes thermal expansion while providing a cooler working surface. The black layer includes carbon black and thermal stabilizers to assure exposed longevity. Contrasting colors also provide a vital function for ease of damage detection during installation. Click here for Product Data Sheet.